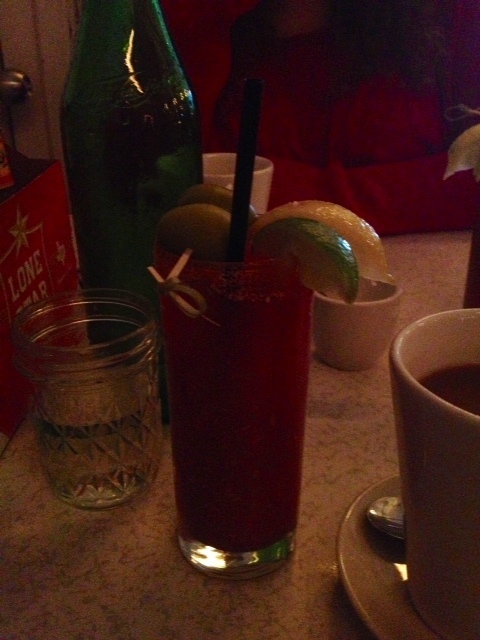 High quality photo of a Bloody Mary I actually ordered and drank one time. I was going to tell the story of how I left my glasses at a bar on Friday night because I wore them while I was singing karaoke and dropped them or something – I don’t remember – so I had to go back there on Saturday night to pick them up and while I was walking there, already full of feelings like shame and self-loathing, a dude rejected me via text message. I don’t really want to go into it but it does have a little bit to do with how I ended up with a Bloody Mary I didn’t order on Sunday. I went to see Django Unchained on Sunday with some friends because it seemed like a good idea when we were partying very early that morning, after partying until sometime kind of early the previous morning, to buy tickets for a 2:30 PM show. When we got to the theater, all of us were obviously feeling, for lack of a better word, great. This particular theater has waiter service which is usually super nice. This time, it ended up being kind of stressful. I really don’t remember if anything was said after that. The waitress moved on to the people in the seats next to us and I waited for the movie to start. Right after it began, a shadow appeared with three drinks for me: a water, a Diet Coke and a Bloody Mary. Which was confusing, because I didn’t think I had ended up ordering one. However, I didn’t tell anyone, not even the person who delivered my order of tater tots – my second order of tater tots in twenty-four hours – that I didn’t want the Bloody Mary. I proceeded to drink the water and the Diet Coke. I let the Bloody Mary sit there for three-quarters of the almost three hour-long movie – the ice melting, the celery wilting, the olives still uncomfortably skewered on their extra long toothpick or whatever it is that they spear the olives on. (I never eat the olives; I hate olives.) I kept thinking, maybe I should drink this thing as long as it’s in front of me. But I didn’t. Not for a very long time. Finally, just before the waitress came with my check, I removed the paper from the straw and took a sip of the Bloody Mary. It was vile. Like, probably the spiciest thing I’ve ever tasted and it immediately gave me heartburn. But then my check came and I just…paid for it. Of course, now, I’m asking myself why I did this. And I guess it was because I still wasn’t sure if I had said something that would have made this waitress think that I did indeed want a Bloody Mary even though I said I wanted a Diet Coke instead. (So probably, on a deeper level, because I’m afraid of any situation that could possibly lead to confrontation.) And also because that movie was like a million hours long and I just wanted to get the F out of the (OVERWHELMINGLY hot) theater, especially considering the last half hour was some really unnecessary and self-indulgent garbage.